Looking for a birthday card for the men in your life? I designed two free printable birthday cards that you can use for your husband, boyfriend, brother, dad or any other male. Download the templates for free at the end of this post. The Coke bottle birthday card would be perfect for a dad or husband. 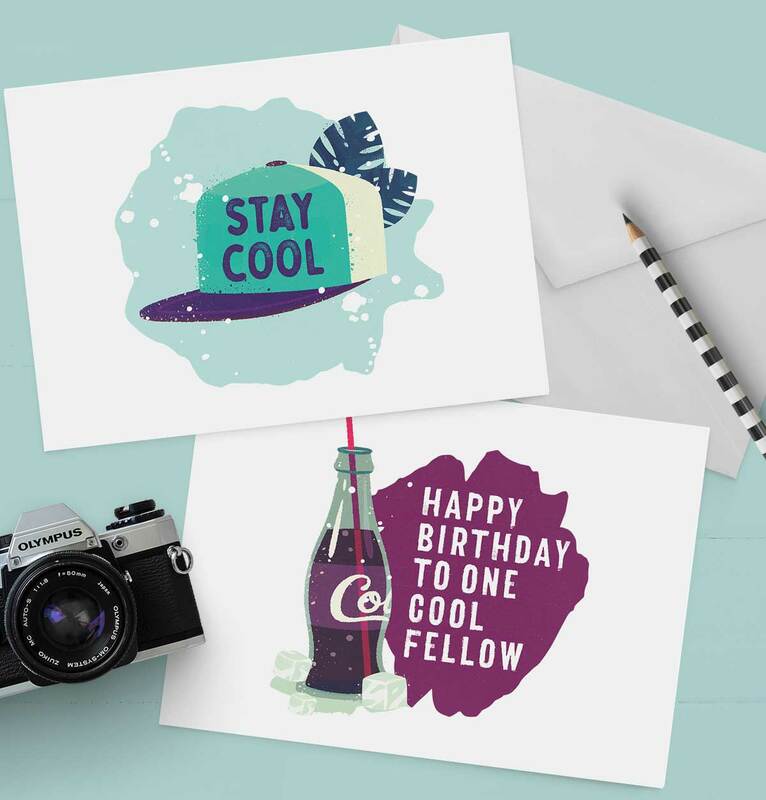 The hat birthday card would be perfect for a brother, friend or co-worker. But feel free to use them however you wish! Are you in need of a last-minute birthday card? Luckily for you, the internet is to the rescue! 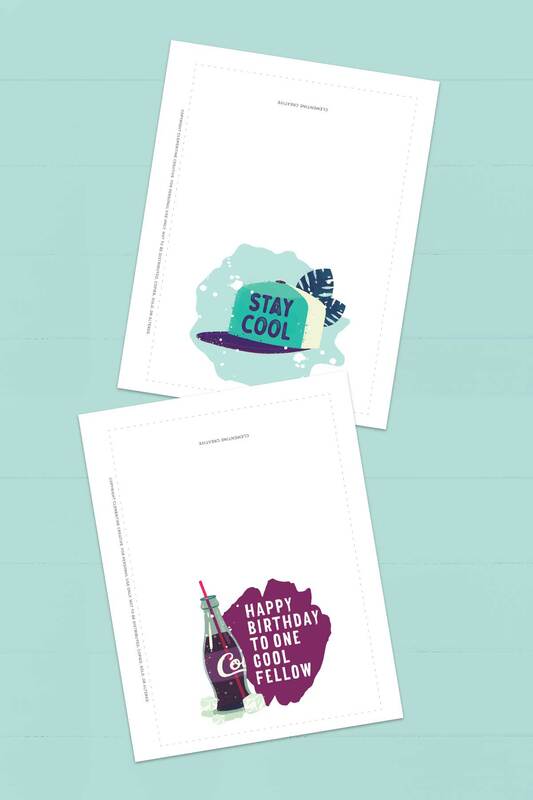 You can download these two card templates, cut out and you’ve got yourself a professional birthday card. No one will ever know that is was a DIY job! These cards are easy to make and it won’t take up too much of your time. Scroll down until the end of the post for the download button. P.S. You might also like these free Father’s Day cards I shared a few months ago. I created these birthday cards using the Freshy Design Set I purchased from Design Cuts. I just love all the elements and can’t wait to use it for some summer projects. If you would like this set for yourself to create matching gift tags, invitations, stickers and more, you can grab it here. Download the PDF files below to your computer. Open the PDF files in Adobe Reader. Go to File – Print. Print the cards on Cardstock. You can print at home or a copy shop. Fold the cards in half and place in an envelope. I’d love to hear how you will be using these gorgeous birthday cards. Leave me a comment below! 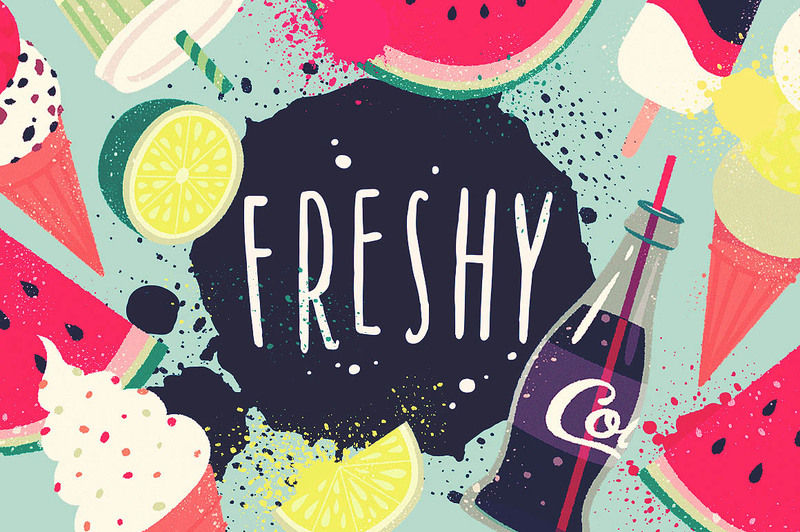 Enjoyed this freebie? Please share it on Pinterest! Keep your eyes peeled because in a few days I’ll be sharing more printable birthday cards. This time for women!